Joe’s Question Corner: Which Padding Glue Do I Need? A: Padding Compound is essentially a thick, glue-type substance that is applied to the edges of plain paper to bond them together. You know, it’s the gummy substance used to hold sheets on a notepad. Once dry you can separate the number of sheets you desire. Fan-A-Part Adhesive is specifically designed for carbonless forms (commonly referred to as NCR Paper or no carbon required). This thinner compound acts more like an activator as opposed to a glue. 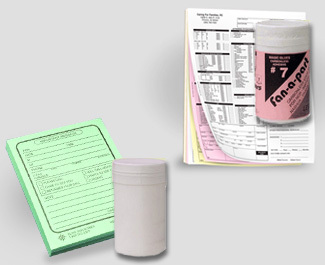 The carbonless form sheets are coated on one or both sides depending on the set count. For example: a 3 part form (white, yellow & pink sheets), the top white sheet would be coated on the back, 2nd the yellow has the coating on both front & back; while the last pink sheet is only coated on the front. When the Fan-A-Part was applied, the coated sides activate and stick together – allowing the forms to be “fanned apart” in sets of three once dried. This compound will not work on regular paper. For additional help with padding, watch our video overview of the padding process. Do you have a question you’d like us to help with? Just ask away in a comment below – or better yet – ask your question on our Facebook wall and get entered to win our monthly giveaway of a $50 Amazon Gift Card. A common question that we frequently get asked is, “How do I use padding compound?” In this post, we’ll show you what’s needed to get started – and how to pad, with a padding press and without. 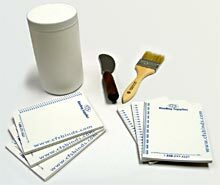 Padding compound is used most often to create notepads, to pad together forms or applications or coupon payment books. Sometimes called pad glue or gum padding, it resembles a thicker, white craft glue, but it uses different adhesives and drying agents. Depending on your workload volume (and your patience) a padding press might save you considerable time and hassles. It can help speed up your finishing work since it makes quicker, easier work of stacking and it allows you to pad more sheets at once. The first step with nearly all padding presses is to attach the stacking backboard panel on the press. Place some extra paper or chipboard on the bottom of the press. You’ll need to prepare your sheets for padding using chipboard or colored sheets to show the bottom of each pad. Jog your sheets in manageable lifts and stack them cleanly in the press against the stacking board. Keeping the sides of the stack flush and straight. Add some additional sheets or chipboard on top of the stack. Then place the clamp plate in the press and tighten it down. The stack’s padding surface should be like a solid brick – having airspace in there will cause the sheet to warp excessively from moisture or the pads may even fall apart. Apply the padding compound with a pad brush – just a thin to medium coat is all that’s needed. Applying more than one coat really does nothing to further grip the sheets, it just puts more compound on top of the first coat. Be sure to brush from the middle to the outside, otherwise you’ll get glue on the sides too. Always soak, then wash your padding brush with just water so that the padding compound will not harden it it. Allow the padding compound to dry – it’s usually dry to the touch within 20 to 60 minutes. Once dry, release the clamp & use a pad knife to slit the pads apart. If you applied the correct amount of compound, the sheets peel off cleanly, leaving no skin of pad glue stuck to the pad. Padding can still be done without a padding press using the edge of a table or countertop. Prep the work are by folding a channel out of paper or card stock to catch excess glue. Fold it so that if viewed from the side, it looks somewhat like a square root symbol. Place your glue catcher at the edge of your workspace & hold it in place with some extra scrap paper or chipboard. Begin stacking your sheets to be padded, Jog them in manageable lifts and try to keep all the edges as flush & flat as possible. Once complete add a heavy weight on top of the stack at the padding edge. The stack’s padding surface should be like a solid brick, having airspace in there may cause the pads to fall apart. Now apply the padding compound with a pad brush. Remember, just a thin to medium coat is all that’s needed & to brush from the center outward. Make sure you soak, then wash your padding brush with just water so that the padding compound will not harden it it. Once it’s dry to the touch – within 20 to 60 minutes. remove the weight. Finally, use a pad knife to slit the pads apart.